Montana, nicknamed "Big Sky Country" for its expansive skies, got its name from the Spanish word, "montaña", in reference to the Rocky Mountains. Actually, the state's eastern two-thirds are part of the Great Plains region and characterized by agricultural and livestock industries. The western third is dominated by the Rocky Mountains and its multitude of skiing/hiking areas. Montana is the fourth largest US state. 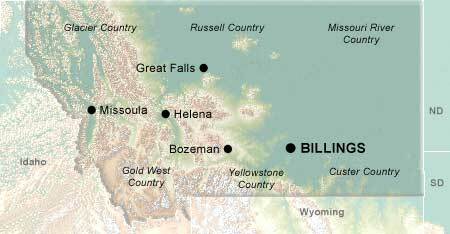 The bulk of the population is located in rugged western Montana. Great Falls, in the eastern foothills of the Rockies, Missoula, Helena, the state capital, and Bozeman are all in the hill country. Billings, the state's largest city, is situated in the south central portion of the state and is nearly surrounded by four mountain ranges: the Beartooths to the southwest, the Crazy Mountains to the west, the Pryor Range to the southeast and the Snowies to the north. The first major appearance by white men in the territory was made by the Lewis and Clark Expedition in 1804. Later, fur trappers and traders were followed by Roman Catholic missionaries. They built Saint Mary's, a mission generally thought to be the first permanent white settlement in Montana. As with many areas of the west, the territory experienced both boom and bust times. Populations soared when gold was discovered in the 1860s, but those boomtowns became ghost towns when the precious ore played out. An exception was Butte, just southwest of Helena. Although silver was a large part of its economy, it was copper that was to be its mainstay. One of the largest copper producers in the world, the Anaconda Mining Company, came together as an amalgamation of several smaller mining operations. Today, much of Montana is set aside as wilderness preservation area, including the 1 million acre Glacier National Park and 1.5 million total acres in the Bob Marshall Wilderness and Great Bear Wilderness Area complexes. Other attractions for outdoor lovers include the Yellowstone River, the Missouri River, Fort Peck Reservoir and Flathead Lake. In addition, the state has scattered state parks and National Forest recreation areas, including Kootenai National Forest, Flathead National Forest, Lolo National Forest and Bitterroot National Forest, to name just a few.